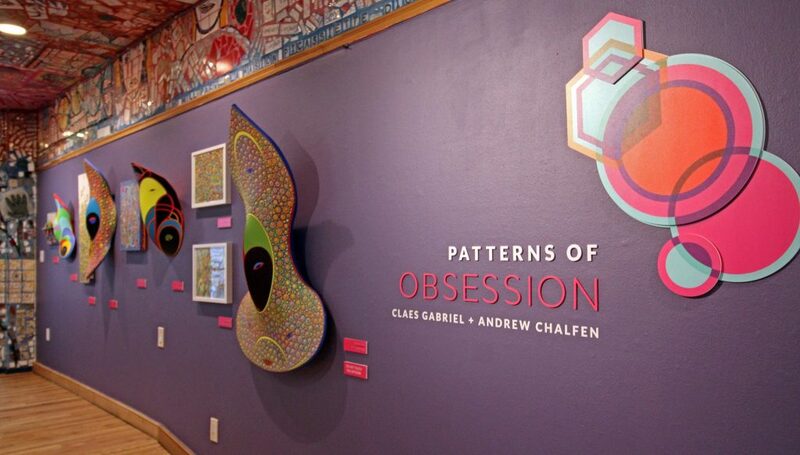 “Patterns of Obsession” features the vibrant work of artists Philadelphia-based painter and musician Andrew Chalfen and local Haitian painter and sculptor Claes Gabriel. The psychedelic labyrinths of Isaiah Zagar’s Philadelphia Magic Gardens are being infused with new types of surreal chaos. Fostering a continuation of its seemingly endless concoction of color on South Street, the mosaic oasis is presenting a new exhibition, “Patterns of Obsession,” in partnership with Paradigm Galleries, which runs through April 28. 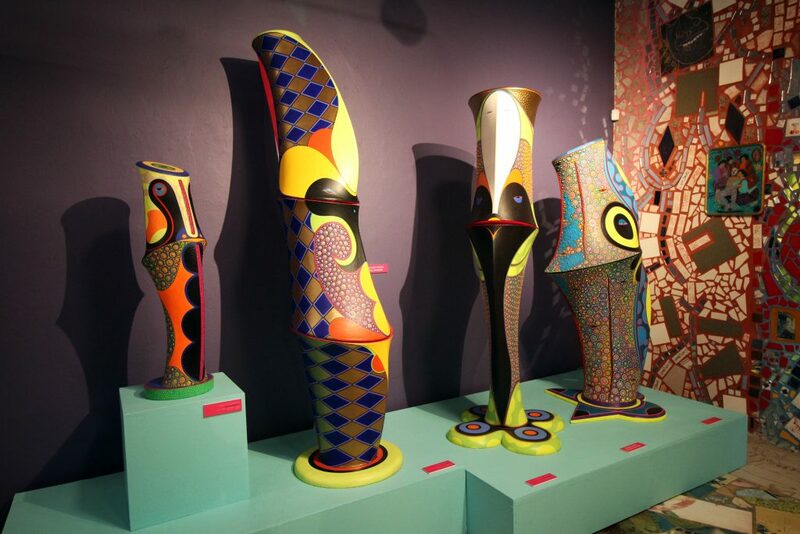 The tandem showcase features the variegated creations of Philadelphia-based painter and musician Andrew Chalfen and local Haitian painter and sculptor Claes Gabriel. Encompassing more than 40 pieces of work, the duo delves into their own impressions of scattered sequences, evoking indistinct shapes and stories through tangled hues. 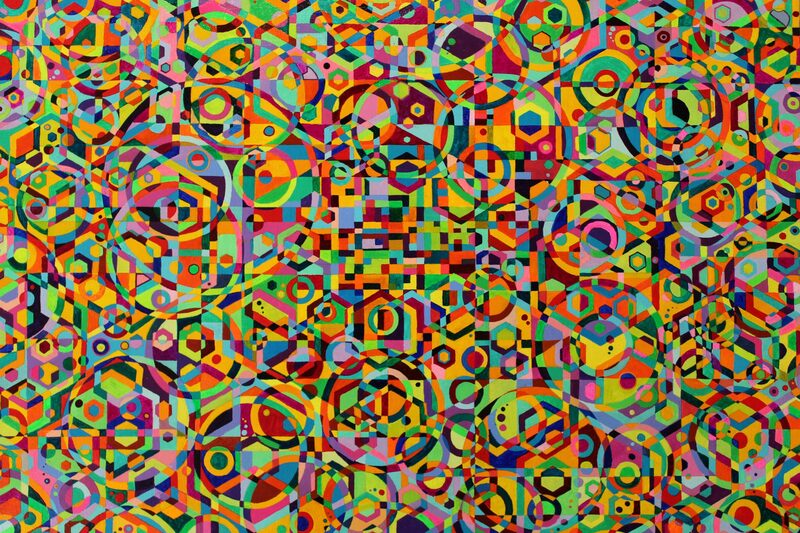 Though presenting different mediums, the artists share a similar ingenuity of getting lost in the details, as they notice the patterns of real-life networks – whether a meandering river or expanding galaxy – living within a procedure of paint strokes. Chalfen’s work, which includes paintings dating to 2011 through new ones created this year, are inspired heavily by topography, such as aerial views a lot and elevation lines. Using a canvas of kaleidoscopic shades inspired by his older brothers’ Beatles and Jimi Hendrix album covers, Chalfen’s palette complements Gabriel’s hollow wooden masks and free-standing statues that derive from Hatian mythology, voodoo and mysticism. Moved by the work of Frank Stella and Sam Gilliam, Gabriel, whose exhibition work also ranges from the past few years, wanted to break out of the traditional painting square, as gradually his work evolved from off the walls. With the end stick of a paintbrush, Gabriel drops the colors layer by layer until his exquisite patterns, which often result in seraphic facial features, complete themselves. Similarly, Chalfen says his process also feels instinctive, as the guitarist, keyboardist and songwriter notices the execution of his work, which often involves sketching images and then returning to the pencil lines with paint, echoes his musicianship. After all, music is among many things that follow a pattern. “There’s a definite overlap between my musical creative life and my visual creative life in terms of, especially, arrangement and spacing and densities and placings of the work,” Chalfen said. Both artists tend to approach their blank canvases lacking bounded ideas. Instead, they let the randomness take over, putting certain parameters in motion and seeing what happens. Once a decision is made, other decisions sort of follow, they say. With so many variables, the artists often can’t predict what’s going to happen next. Although stressful, the arbitrary process is often therapeutic, and, perhaps, audiences will gravitate into such transcendence, too. But their fortuitous systems are the result of a certain visionary zeal embedded in the exhibit’s very title.